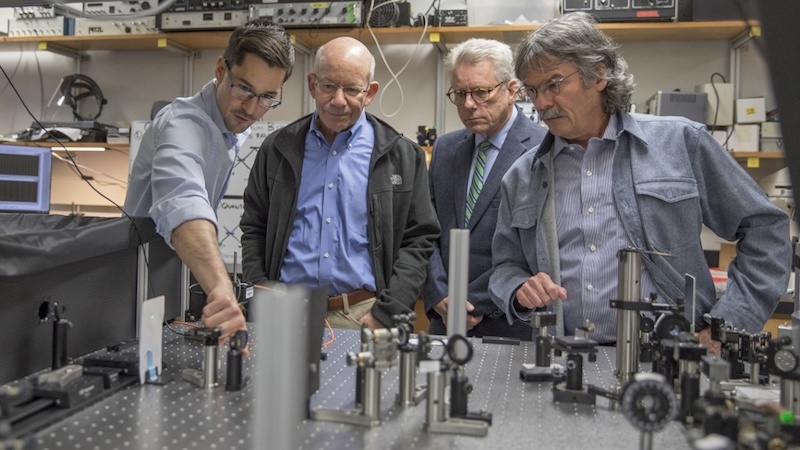 The importance of photonics and quantum physics was on full display Friday during a visit to campus by U.S. Rep. Peter DeFazio. DeFazio, the ranking Democrat on the House Transportation and Infrastructure Committee, received a primer on qubits — units of data that can exist simultaneously in two states. In explaining how scientists are trying to harness qubits by manipulating their paths, Jonathan Lavoie, a research associate in the Department of Physics, used a green laser with an intensity 70,000 times dimmer than that of a $30 laser pointer. The demonstration was done in the lab of Michael Raymer, a Philip H. Knight Professor and co-founder of the UO’s Center for Optical, Molecular and Quantum Science. Raymer hosted the DeFazio visit as part of a push by the National Photonics Initiative for a national quantum initiative. In a brief talk, Raymer noted that while the U.S. has pioneered the basic science behind photonics — the study of light and its interaction with small molecules — and quantum science, China, the United Kingdom and other nations across Europe have already committed large investments to develop quantum computing. That, he said, could challenge U.S. leadership. The U.S. needs a concerted effort by academia, government and industry, Raymer said. As part of a national investment, he said, the National Photonics Initiative recommends $500 million in new public funding over five years to be split among four top-level national labs, with each focusing on a primary objective. Each would then funnel research funds to satellite labs where scientists are pursuing related projects. Raymer, under the auspices of the National Photonics Initiative, co-authored a 2016 white paper calling for a quantum initiative that would facilitate economic growth and help the U.S. keep pace with accelerating international competition. Raymer described three pillars that underlie quantum science: computing capabilities that could lead to improved designer molecules, machine-learning and artificial intelligence; communications featuring enhanced data encryption for security; and sensing capacities that could benefit such things as biomedical imaging, GPS-free navigation and gravity measurements. A public investment, Raymer said, would allow U.S. scientists to advance the technology to a level where it would be adopted for development by industry, following a path similar to the internet. Continued investment in photonics, which is at the heart of quantum science, would lead to advancements for the infrastructure of the nation’s transportation system. After Raymer’s talk, 2012 Nobel laureate David Wineland, who recently joined the Department of Physics as a Philip H. Knight Distinguished Research Chair, and Brian Smith, newly recruited from the University of Oxford and part of the U.K.’s quantum initiative, helped answer DeFazio’s questions. Raymer’s leadership was recognized last October by Oregon’s U.S. Rep. Suzanne Bonamici, D-District 1, during a hearing by the House science committee. In mid-February, Raymer will join other scientists in the National Photonics Initiative for meetings with a U.S. House working group on science and technology to help initial efforts to craft a potential budget and implementation plan for a U.S. quantum initiative. The National Photonics Initiative is a collaborative alliance among industry, academia and government. It is led by a coalition of scientific societies, including the American Physical Society, the IEEE Photonics Society, the Laser Institute of America, the Optical Society and the International Society for Optics and Photonics.